So much of the art scene in downtown Philadelphia comes nearly to a halt during the late summer months, as residents scatter throughout the tri-state area to the New Jersey, Delaware and Maryland beaches. However, the contemplation of and dedication to craft is alive and well in Olde City Philadelphia’s The Clay Studio. Last Friday, The Ninth Annual Marge Brown Kalodner Graduate Student Exhibition opened to a gallery full of avid art viewers. 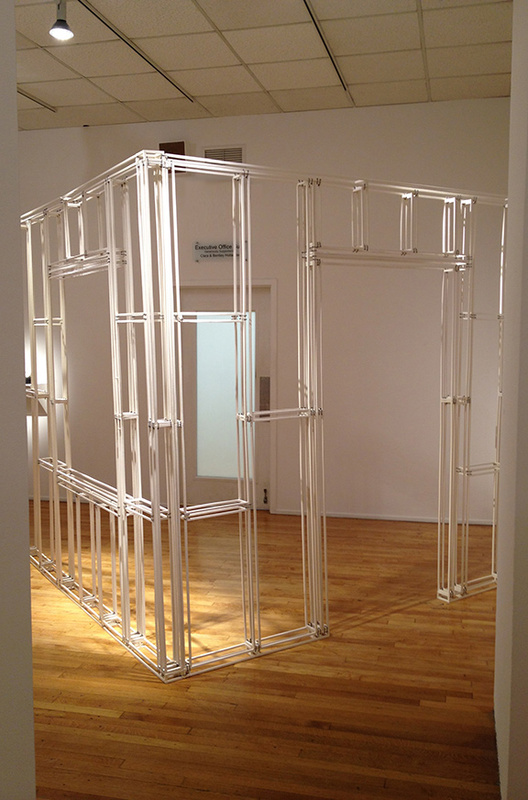 Margaret Dubler’s Frame (State University of New York at New Paltz: Ceramic, Zip-ties, 2012) is an installation occupying much of the gallery space’s back room. At first sight, one could almost believe that they are walking into an illusion. Dubler’s use of ceramic linear rectangles to delineate the framing of space is subtle, yet the scale of the piece demands one to literally “walk through the door” of negative spaces. One could easily mistake this install to be fabricated of cast steel rods with white enamel that have been produced industrially for the purpose of holding what one may deem as “precious art” – instead of the white lines/rectangles forming the artistic fabric of the installation itself. Conversely, the artist could be parodying the artworld’s adage of the “white box” – how an individual feels when entering into a gallery space that rarely, if ever, has any color on the walls except white, and using that metaphor in her materials of ceramic being parlayed as metal. Jackie Laurita’s Rainbow (Cranbrook Academy of Art, MI: Porcelain, Silk, 15″ x 12″ x .5″, 2011) is a stunningly beautiful piece that traverses the lines between wall piece, relief, or body ornament. 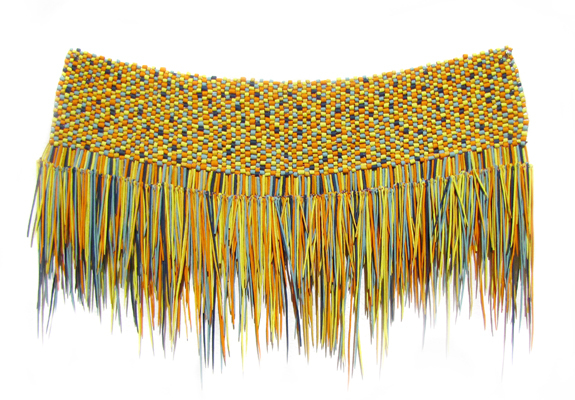 The consistency of her shapes, both the small tubes placed alongside the cascading quills of pigmented porcelain, communicates a finely-tuned rhythm with which Laurita uses to weave her elements together. Who would believe this is predominantly porcelain and not a fiber piece upon first look? It is quite masterful how Laurita ornaments the walls of the gallery by secretly luring one into thinking that this dramatic piece is meant to be a sculpture – vs. a wearable object for one to indulge themselves. Erik Wilhelmsen’s The Airy Sky Has Taken Its Place (University of Massachusetts Dartmouth: Earthenware, Glaze, Paper, 32″ x 40″ x 7″, 2012) seemingly may be inspired by or titled after a line from the “Vermeer” poem – written by the 2011 Nobel Prize for Literature winner and Swedish poet, Tomas Tranströmer. Wilhelmsen approaches this work in a very abstract painterly way – similar to a Rothko or de Kooning painting that is instead a multi-dimensional ceramic vessel. The drips of the glaze as they run downward can’t help but remind one of the abstract expressionists of the early twentieth century. The intimidating scale of this vessel and the texturing of the “skin” of the handbuilt earthenware is countered by the more intimate, narrow mouth (opening) of the piece. The Ninth Annual Marge Brown Kalodner Graduate Student Exhibition can be viewed through August 12th, 2012 at The Clay Studio located at 137-139 North 2nd Street in downtown Philadelphia, PA. I enjoyed reading this very much. I used to be a ceramic artist and though I haven’t worked in clay for many years now, this inspires me. Thanks for posting this! Anita, I find your paintings very inspiring and find myself visiting your blog regularly just to enjoy seeing more of your work. I hadn’t realized you also have been involved with ceramic arts before, but I can see how your paintings have such a beautiful 3-D aspect to your surfaces – thanks so much for your comment and stopping by! Thank you so much! Yes, I studied with a well known ceramic sculptor on the West Coast, Viola Frey, in the 80’s. She died a few years ago. I was very influenced by her, and I eventually sculpted life size standing figures…but, the process got to me…took too long to finish a piece. I started painting because of the immediacy of the medium. You are so right on about the surfaces of the paintings…especially when I mix oil paint with cold wax medium, there is so much “body” that it almost feels like clay. As always I enjoy your posts and look forward to the next! Figurative clay sculpture does look very labor-intensive, and I can appreciate how painting gives you a sense of immediacy. I find the same dichotomy in my own attraction to the immediacy of graphic design vs. the very involved, tedious planning in my metals’ artwork/jewelry. Thanks so much for your insightful comments, Anita! Thanks so much for the link. I enjoyed reading the article very much. Just one last thought about Viola, I think her huge sculptures of men in business suits seem very timely! Like they’re in charge of the world which they actually are (too big to fail are their banks, yes? ) Best of luck with your creative endeavors! I want to jump on a first bus to Ph. to see it…. Barbara, I would love to see what you could do with the vistas and images of the city of Philadelphia in your work!! Philly is a truly underrated art town. Thank you so much for stopping by artdoesmatter and commenting! Thanks for liking my blog post and thanks for writing about this exhibition. The works you’ve written about sound amazing. I truly enjoy following your blog, Lu! It’s great! Thanks so much for your lovely comments and for stopping by! I am really excited by this – thank you for posting! Thanks Anna for your nice comments. I’m really enjoying your blog, and I like hearing about your new work (including how you made those plaster molds for your new bowls!) Keep up the great work! Hi, thanks for picking up & following Pete’s Pots across the pond. I’m happy to reciprocate, after browsing your posts. You have some good ceramic exhibitions in your part of the world, nicely reviewed. I particularly like Ani Kasten’s work, far more sophisticated than my run-of-the-mill pots. Thank you for the kind comments and for the follow, Pete. I’m enjoying following your blog very much. 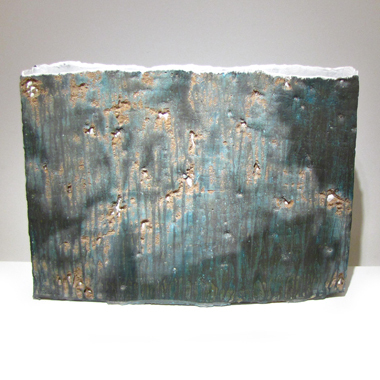 Philadelphia does have some exceptional work to see (like Ani Kasten’s pieces) because of The Clay Studio gallery here. But I would not discount your work as run-of-the-mill; the two new “orbs” that you have pictured look fantastic; best of luck to you at your upcoming show! Nice post. I just finished grad school with Maggie. Her thesis show was fantastic. I’ll pass this onto her. Thanks so much, Aran – I’d really appreciate that! Did you do your grad work in metals while at New Paltz? I was there under the great Jamie Bennett and Myra Mimlitsch-Gray, having graduated. Was the best thing I ever did. Thanks again for stopping by; I’m truly enjoying your Bittersweet Project blog as well. What an interesting perspective you’ve got there, Sue. I like how you think. Thanks so much for your insightful comments! I’m very much enjoying your blog, by the way! Thanks for following me and thanks for such an interesting blog ! I used to teach ceramics and I’ll never forget the joy of opening the kiln to discover the work had survived in one piece and that dull glazes had been transformed into wonderful vibrant colours ! Thank you Chris for your insightful comments. I do agree w/ you there about that moment just as the kiln is opened. I’m really enjoying your blog as well – esp. your paintings. Thanks again for stopping by!